St. Michael’s High School or, as it was first known, El Colegio de San Miguel, was conceived in the mind of Jean-Baptiste Lamy, the first bishop and archbishop of Santa Fe, New Mexico. He began efforts to establish a school upon his arrival in Santa Fe in 1851, but it took seven years to recruit four Christian Brothers from his native France. Brothers Hilarien, Gondulph, Geramius and Galmier Joseph arrived on October 27, 1859, exhausted after two and a half months of travel by ship, train and covered wagon. The Brothers were welcomed warmly and set up in the first buildings of El Colegio de San Miguel, which, like most Santa Fe buildings, were made of adobe and had dirt floors. Some of these buildings, including the San Miguel Chapel, remain standing today on Old Santa Fe Trail and De Vargas Street. Bishop Lamy guaranteed the school two years of full financial support but expected it to be self-sufficient after that. Essential to the school’s economic survival were student boarders, who first arrived on November 9, two weeks before classes began. And on November 22, 1859, less than one month after their arrival in New Mexico, the Christian Brothers commenced classes at El Colegio de San Miguel for both boarders and day students. By 1862, boarder revenue allowed the Brothers to invest in a savings account. By 1870, however, the enthusiasm for the school in Santa Fe had fallen; all but one of the founding Brothers were gone, and many of their successors were in favor of closing the school. A German Christian Brother named Peter J. Schneider was sent from New York to convince them to stay. Schneider, known as Brother Botulph, opened a novitiate to train local student Brothers and traveled several times to the east and west coasts to recruit more Brothers to Santa Fe. He also persuaded the bishop to donate some of the buildings and land to the Brothers and then formed a non-profit corporation to buy the remaining property. In 1874, the territorial legislature granted the school a charter as the College of the Christian Brothers of New Mexico. In 1876, St. Michael’s conferred diplomas on its first graduates. In 1878, Brother Botulph conducted the school’s first capital building campaign; the groundbreaking took place on April 11 and St. Michael’s first classroom building opened on November 1. (This is the present-day Lamy Building on Old Santa Fe Trail, which had three stories until the top level was destroyed by fire in 1926.) In 1879, Brother Botulph recognized the people who made the construction possible by publishing a list of donors in newspapers in Santa Fe, Albuquerque and Las Vegas, NM. Ten years later, Brother Botulph launched a second fundraising campaign for new construction to accommodate the growing student body. A three-story building was erected but was used as the territorial capitol for two years before the school began using it in 1889. It stands today behind the San Miguel Chapel and is used as a state office building. Brother Botulph passed away at St. Vincent Hospital in Santa Fe on February 9, 1906. He left behind a legacy as one of the most well-known and well-respected educators in the American West. His accomplishments at St. Michael’s included developing a high school program, introducing college-level courses, and, in 1893, obtaining authorization from the territorial legislature to make St. Michael’s a teacher-training college. He traveled extensively as a recruiter and fundraiser and also held public office as a member of the Santa Fe County Board of Education and the Territorial Board of Education. When the first public schools were established in Santa Fe, Brother Botulph supplied Brothers to teach for several years until a sufficient number of lay teachers could be trained. In 1911, alumni honored Brother Botulph by erecting a marble bust of him in front of the 1878 building. The bust now stands in the gardens in front of the Siringo Road school building. In 1916, the culture of St. Michael’s was shaken up when a group of French Brothers replaced the American Brothers at St. Michael’s as well as at other Lasallian schools in the region. The students were at first quite unhappy by the shift and enrollment dropped sharply, but soon the newcomers infused the school with fresh life and spirit and ultimately propelled growth in enrollment, facilities and programs. The science labs were remodeled, the school’s first gymnasium, financed by alumni donations, was constructed, and athletic teams began competing in New Mexico’s fledgling interscholastic sports program. Some hard decisions were made during this time however; after World War I, the college program was dropped due to financial concerns. In 1926, a fire destroyed the third floor of the Lamy Building. Contemplating the school’s probable closure, the school’s director, Brother August, took a walk on the downtown Plaza, where he ran into alumnus and wealthy business man Miguel Chavez, who donated money to construct a new school building just south of the Lamy Building. This structure was used until November 1966, when St. Michael’s High School moved to its current location on Siringo Road. Today, SMHS honors Miguel Chavez with a legacy society named after this patron saint of our school. 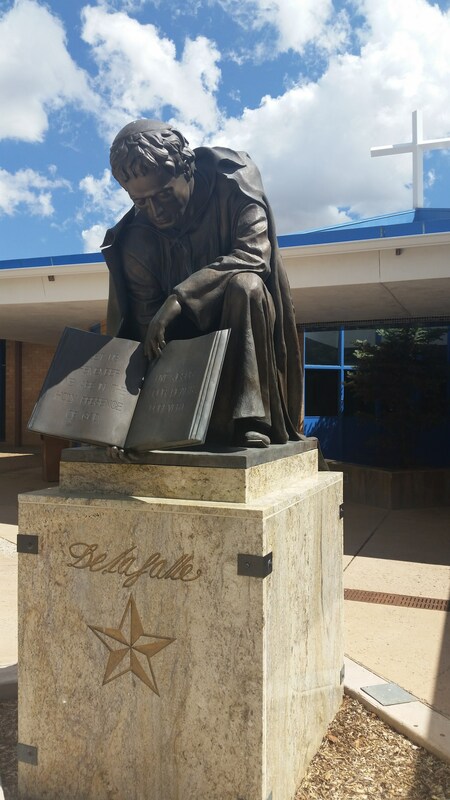 St. Michael’s High School remains firmly rooted in the Lasallian Tradition and the Roman Catholic Faith. However, since 1967 there has been a gradual but steady increase in the number of lay teachers at St. Michael’s and at all Catholic schools in the United States. As the Brothers grow older and retire, it is inevitable that St. Michael’s will soon have an entirely lay faculty. The Christian Brothers, both worldwide and locally, welcome this new challenge. They believe St. Michael’s, like many other Lasallian schools formerly staffed by Brothers, can carry on their tradition under a new kind of leadership. In 1988, St. Michael’s admitted its first lay person to the Board of Trustees and soon after hired its first lay, and first female, principal. Construction on new science laboratories, a student parking lot and the Tipton Sports Center began in 1997. In the first decade of the twenty-first century, St. Michael’s erected an additional classroom building and improved its athletic fields. 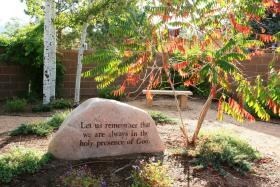 A prayer garden has been created and a statue of St. John Baptist de La Salle now stands at the school’s front entrance. 2009 marked the 150th anniversary of St. Michael’s High School, which thrives today as one of New Mexico's leading private schools. To commemorate the milestone, the school held a series of events, culminating in a gala fundraiser and alumni reunion, in the spring and fall of 2009. St. Michael’s currently operates under a president/principal model, which was established by the Christian Brothers as part of a strategy to perpetuate the Lasallian tradition will into the 21st century. A new principal, Sam Govea, joined SMHS in July 2010 and St. Michael's appointed Taylor Gantt as president in May of 2014. St. Michael’s High School, with a college preparatory curriculum, has as its mission to educate each student in the spirit of faith and academic excellence according to Roman Catholic principles of the Christian Brothers.